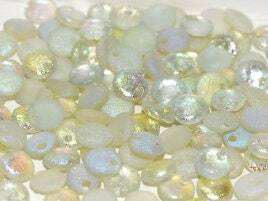 I very excited to be carrying a large selection of 6mm, single hole, top drilled lentil beads! This listing is for 50 pieces of these gorgeous 6mm top drilled lentil beads with an etched textured feature in a crystal green rainbow color. These new etched beads combine matte, frosted, and shiny finishes with sparking metallic highlights. Amazing finish and texture. You will receive 50 loose beads.